International education graduation cords can be worn by graduating high school seniors at their commencement exercises if they have completed a diploma program in international education, and if their school awards, or allows such cords. How a high school or international education program at a school wishes to recognize students at graduation is up to them, but honor cords are an excellent way to show achievement. Honor stoles, also carried by Honors Graduation, can show completion of their education program. These programs where students can earn special diplomas are a great way for students to excel in their studies and achieve more than just the bare minimum. IB the acronym stands for International Baccalaureate. IB graduation cords may be provided by some official source in conjunction with the International Baccalaureate program, however Honors Graduation is not aware of any such program and is not affiliated with the IB organization in any way. Some organizations that offer honor cords specifically targeted at secondary (as opposed to post-secondary or collegiate) students will offer a shorter cord. These cords will often be between 54-60 inches in length as opposed to the ~70 inch cords offered by Honors Graduation. Many schools choose blue honor cords or gold honor cords to honor students of international education. 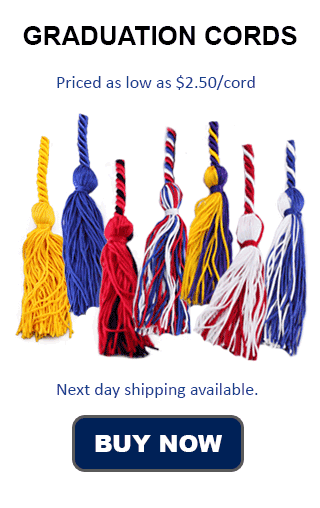 Honors Graduation carries three shades of blue that could be used as Honor Cords : Navy Blue, Royal Blue and Light Blue. Gold is also an intuitive choice because gold is a color that is associated with honors in graduation cords, and earning a diploma or certificate in international education is most definitely an honor. Similarly to blue, Honors Graduation carries 3 shades of gold: Gold (bright gold), yellow (yellow gold), and antique gold (also known as old gold). All of these colors look great on graduates on graduation day. Any of these colors can be worn individually as a single cord, as a double cord, or combined with another color to make a double honor cord of two colors. Honors Graduation also has Royal Blue with Gold Graduation cords and Gold with Royal Blue Graduation Cords.